Looking for something different to grill up for your next barbecue? Try Baby Bok Choy for a surprisingly delicious grilled veggie. Now in season and available supermarkets. 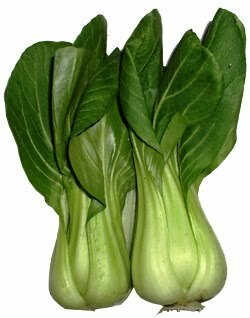 Also known as Shanghai Bok Choy or Green-Stemmed Bok Choy, Baby Bok Choy is about 6 to 10 inches in length – much smaller than regular Bok Choy, which usually measures about 16 inches. Each small bunch features attractive green spoon-shaped leaves with short, wide pale green stems. Baby Bok Choy has a mild, crisp, slightly sweet cabbage-like taste and can be enjoyed raw or lightly cooked. One of the best things about Baby Bok Choy is that it can be cooked whole, making it an attractive addition to plates for summer entertaining. And it’s so easy to prepare. Simply plunge the Bok Choy in cold water a few times to release any dirt or sand. Then shake dry, cut in half lengthwise and brush with oil and sprinkle with salt and pepper. Then place on the grill for two to three minutes per side until just wilted. The grilling process brings out the natural sweet flavor of the Bok Choy without the need for heavy seasonings or sauces. Serve as a vegetable side dish with grilled meats for a satisfyingly simple meal. Versatile and adaptable, Baby Bok Choy can also be steamed, blanched, braised or stir-fried. It can even be served in chopped salads and soups. Select Baby Bok Choy bunches that look crisp and with fresh-looking leaves. Store refrigerated, unwashed in a perforated plastic bag for up to three days. Toss together salad ingredients in a large salad bowl. For dressing, in a medium skillet, fry the bacon until crisp. Drain; reserving some of the drippings in a skillet. Crumble bacon; set aside. In drippings, whisk in lemon juice, water, mustard, salt and sesame seed until blended. Stir in bacon. Immediately pour warm dressing over salad; toss well and serve. Makes 6 to 8 servings.